Brand new to Bristol, Stafford Ave Roadside offers you the great taste of fresh seafood you crave without having to drive to the shore. Owned by Mel Pelletier and Shannon Irvin, Stafford Ave Roadside is ready to give you a food truck experience in Bristol like never before. Owners Mel Pelletier and Shannon Irvin have over 40 years of combined experience. 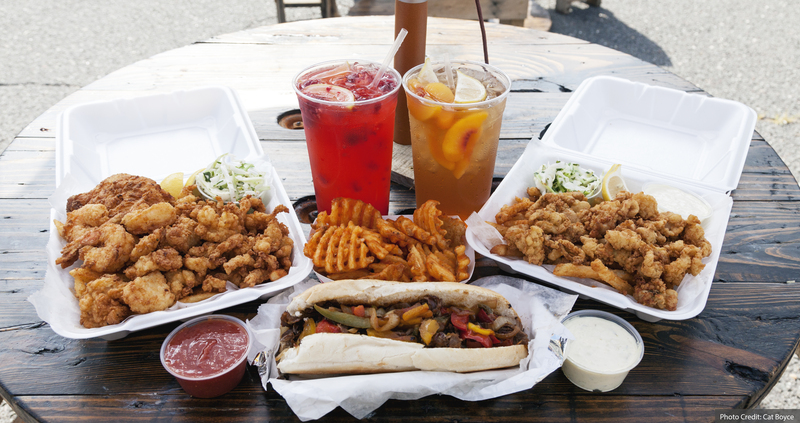 Together they operate two food trucks offering seafood, grill, and fair favorites right here in Bristol on Stafford Ave.
Stafford Ave Roadside’s customers have already compared their seafood to Lenny & Jo’s and Bill’s Seafood, both leading restaurants at the Connecticut shore. Their seafood is delivered fresh everyday and they also make their accompaniments fresh every day including cilantro lime slaw, spicy aioli sauce, fresh mango salsa, cocktail sauce and tartar sauce from scratch to ensure bold flavors in every single bite. They also offer fruit infused Southern sweet tea or lemonade made with real fruit. Options include mango, raspberry, blueberry, peach or strawberry. With cheese steaks, whole bellies, cotton candy, blackened fish wraps, waffle fries, Italian sausage and peppers, a kids menu, a seniors menu, daily lunch specials, and more, there is something for everyone. Try Stafford Ave Roadside to see what the hype is all about!